Difficult-to-machine material parts with curved surface are widely used in automobile, aviation, and aerospace fields, and the high-speed milling is the preferred processing method. In high-speed milling process of the curved surface parts, the instantaneous cutting amount is continuously changing due to the geometric feature change of the determined curve toolpath. In this way, the actual processing parameters, including cutting depth, cutting speed, and feed per tooth, are also continuously changing along the curve toolpath, which will result in a severe variation of cutting heat that has negative impact on the tool wear and the surface integrity. For TC4 which is a kind of typical difficult-to-machine material, a novel analysis method of cutting heat is proposed by transforming from time-varying variable to constant parameter for the dry milling of TC4 curved surface. As the actual processing parameters have strong correlational relationship with the instantaneous processing parameters, including instantaneous cutting area, maximum effective cutting radius, and maximum undeformed cutting thickness, the correlational relationship between the actual processing parameters and instantaneous processing parameters is established firstly. By means of fine-tuning the allowance for finish machining and regenerating the curve toolpath, the instantaneous processing parameters can be adjusted to be constant, and the transforming from time-varying variable (actual processing parameters, including cutting depth, actual cutting speed, and feed per tooth) to constant parameter (instantaneous processing parameters, including instantaneous cutting area, maximum effective cutting radius, and maximum undeformed cutting thickness) is realized. Finally, a series of milling experiments are carried out based on the regenerated curve toolpath. 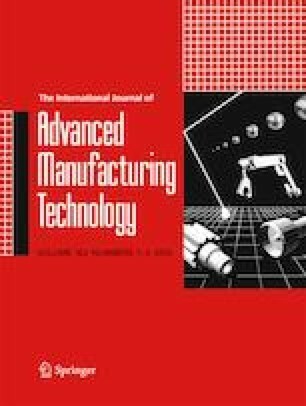 The results show that the cutting temperature fluctuation in curved surface milling along the regenerated curve toolpath is decreased by at least 75.81% compared with that in traditional curved surface machining, which is closer to the variation tendency of cutting temperature in plane milling. Consequently, the cutting temperature variation can be smoother by maintaining the instantaneous processing parameters constant, which is of great significance to restrain tool wear and improve surface integrity. Furthermore, the achievement provides theoretical guidance for the allowance distribution of finish machining in the dry milling of TC4 curved surface. The authors wish to thank the anonymous reviewers for their comments which led to the improvements of this paper. The project is supported by National Science and Technology Major Project of China (No. 2016ZX04001-002), Science Challenge Project of China (No. TZ2018006-0101-02), Innovation Project for Supporting High-level Talent in Dalian (No. 2016RQ012), Science and Technology Innovation Fund of Dalian (No. 2018J12GX038), and the Fundamental Research Funds for the Central Universities.